Travel from the lakes of Michigan to the depths of the ocean at SEA LIFE Michigan Aquarium. 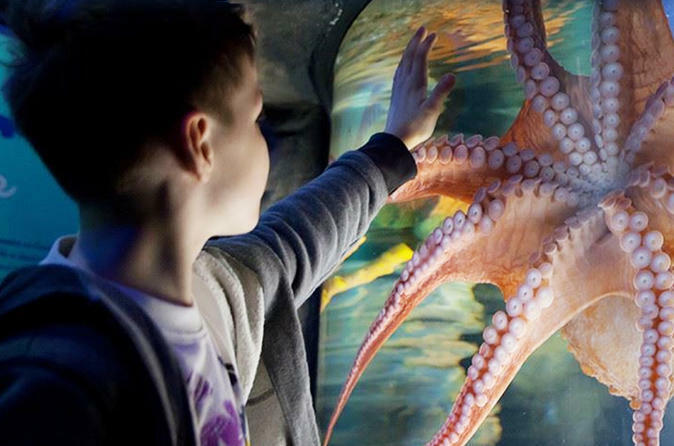 With a variety of unique displays, educational talks, an underwater tunnel and feeding shows throughout the day, there’s plenty for everyone in the family to enjoy. See more than 5,000 creatures, including blacktip reef sharks, gentle seahorses, cownose rays and the giant Pacific octopus. Prepare for an immersive underwater journey from the lakes of Michigan to the ocean and beyond at SEA LIFE Michigan Aquarium, located at Great Lakes Crossing Outlets. With educational talks, animal feedings, the Dive Adventure Trail, and a children’s play area, there’s plenty for everyone in your family to enjoy. At more than 25 authentically themed displays featuring diverse species and habitats, you'll learn about marine conservation and observe some 5,000 animals. Stop by a tank of blacktip reef sharks, which come from the tropical coral reefs of the Indian and Pacific oceans, and enter an underwater tunnel for a panoramic view of sharks as they swim past. Watch a feeding for cownose rays, which swim in schools of up to 10,000 in the wild, and see how they use their synchronized flaps to stir up ocean sediment on the tunnel floor. Spot a giant Pacific octopus, the largest octopus in the world, and search for a male seahorse with a brood of babies in its pouch. Spy clown fish and observe jellyfish floating inside a tank that mimic ocean tides and currents. You can also learn about creatures that inhabit shores and coastal tide, such as sea anemones, sea urchins and horseshoe crabs. Passionate about preserving marine habitats and the species that live in them, the informative staff at SEA LIFE Michigan celebrates everything about the sea. The aquarium hosts shark and ray feedings, as well as educational demonstrations throughout the day. Learn about successful breeding programs for endangered animals, and discover how the aquarium supports worldwide conservation projects.